Tis the Season of fright and hauntings! Do you want to get spooked in the Finger Lakes? 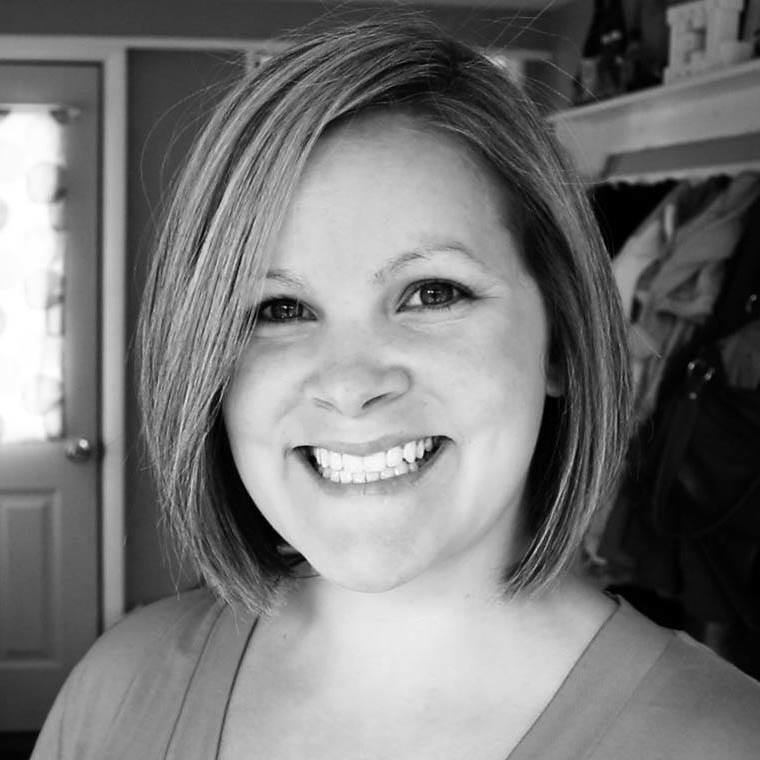 Let’s explore some of the reportedly haunted places in the Finger Lakes and see if I can scare the bajeebies out of you. These are all places where you can have a meal or even spend the night–if you’re that brave. All but one were at one time private homes, and have retained their beauty for more than a hundred years. Esperanza Mansion – There is more to Esperanza than a beautiful view and delicious food, but no one really knows exactly what she is. A lady dressed in white can be seen in and around the mansion from time to time, but it is unclear who she is or why she is there. 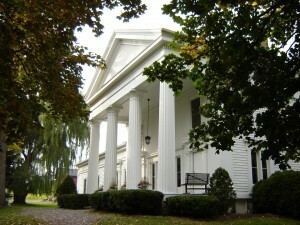 Built in 1838, Esperanza is thought to have once been a part of the underground railroad. 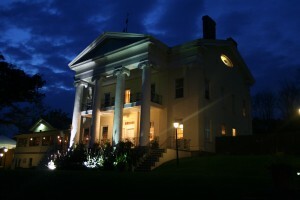 Reported on ghostsofamerica.com, one person writes, “At the Esperanza Mansion I was sleeping in the Catawba. I woke up to the TV that somehow turned on in the middle of the night. I then proceded to turn the TV off. However this repeated one more time. In the morning I’m sure I heard a young teen boys voice laugh…” When I went to Esperanza at dusk to take a photo, I did not see a ghost. The nuts falling from the tree in the front yard though… super creepy sound. Esperanza Photo via Meredith Marsh, inthefingerlakes.com Naples Hotel – This three-story brick hotel was featured on the Syfy Channel’s paranormal investigation show, “Ghost Hunters” in January 2012. Built in 1895, the Naples Hotel has long been rumored to be haunted by a ghost referred to as “Topper”. The team did not find evidence of Topper, but paranormal activity was detected during their investigation. Whispers were heard, framed artwork was moved, and light fixtures fell to the floor. The Naples Hotel offers “Interactive Ghost Investigations” if you’d like to see for yourself. If you’re not exactly ready for ghost hunting, you could have a nice lunch dinner, or even spend a night. Naples Hotel Photo via Facebook.com/TheNaplesHotel Miles Wine Cellars – If you’re looking for paranormal activity, Miles Wine Cellars is the place to be. 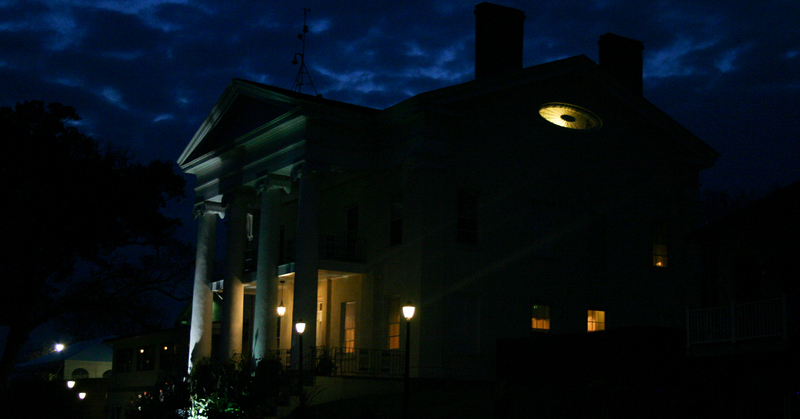 There have been numerous ghostly experiences and strange occurrences at this Greek Revival home that overlooks Seneca Lake. Miles Wine Cellars owners Doug Miles and Suzie Hayes have accepted their ghostly inhabitants and learned to live with them, even naming a wine after them–Ghost. You may not get much “activity” from a bottle of white wine, but you can stay a couple of nights, and perhaps you too will experience your comforter being flung across the room or doors slamming behind you! 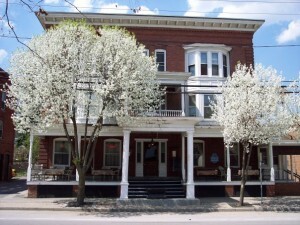 Miles now has an Inn where you can book a room overlooking Seneca Lake. Lovely and mysterious as Miles Wine Cellars is, I doubt I will be staying there any time soon. But I’ve yet to try Ghost, and this is probably a great time of year for a visit. Miles Wine Cellars photo via Facebook.com/pages/Miles-Wine-Cellars/103324433110220 Belhurst – It has been said that at one time, an Italian opera singer fled to America from Spain–to be with her lover. Some way or another, during a flee from the Opera singer’s husband, the couple became trapped in a secret tunnel and parished. 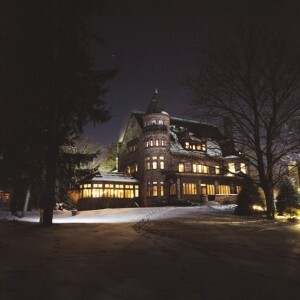 Guests at the Belhurst have reported seeing a woman in white, standing on the front lawn of the Belhurst in the middle at night. Belhurst photo via facebook.com/pages/Belhurst-Estate-Winery/181080365266887 View (Real) Haunted Houses in the Finger Lakes in a larger map Do you have a Ghost Story from the Finger Lakes? Reply below! Great photos! Very interesting, I never realized these places have accounts of hauntings. Great to learn something new, and a little spooky about our area! Oh Iv’e been told that there are many ghosts that hang out at the Cottage! We’ve all seen and sensed different ghosts, even the smell of lilac perfume. The Esperanza mansion has a lot more to it than that look in to it I have talked to a few workers and they said the place is hanted like crazy that back in the day they held people captive in the basement now what they meant u put it together but for real Google it and u will be amazed. PLEASE do a little more research into Esperanza…….the house was built in 1838…….my best friends mother owned it in the 1960s………. Thanks, LJ, that was just a typo. Spent alot of time there as a kid…..definitely some stories from there…..